The Mobile Enterprise: Is Ease of Use Overriding Security? Relying on native applications as you mobilize Microsoft applications can come with some significant security trade-offs. 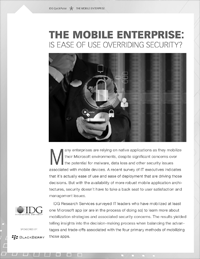 This guide reveals IDG research on lessons learned from enterprises that have mobilized at least one Microsoft application, pros and cons of the 4 most common approaches to mobilizing the enterprise, and advice to satisfy the needs of mobile users without compromising security.